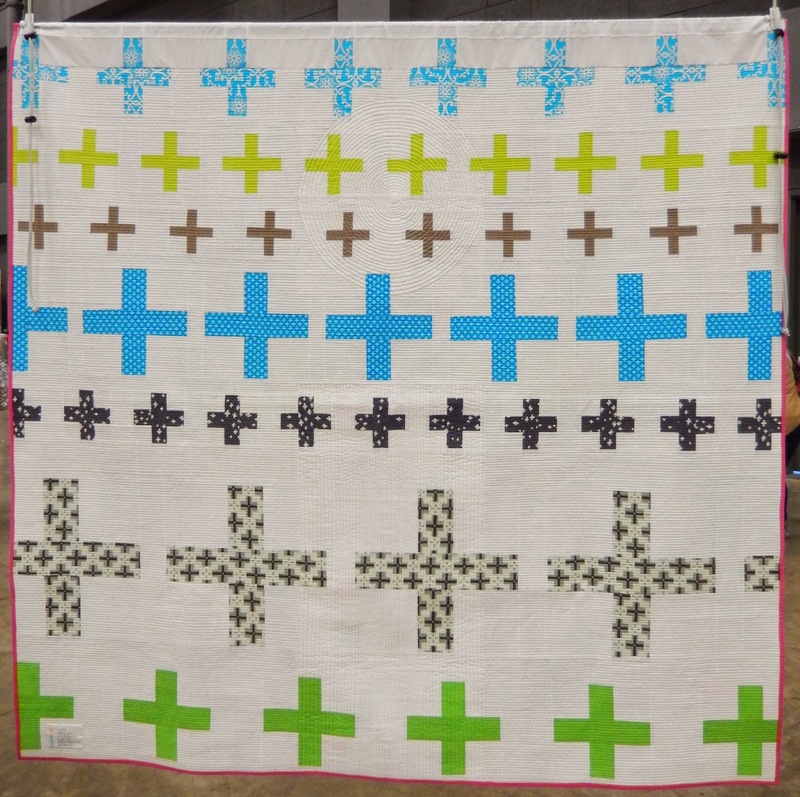 I'd like to show you around a few of my favorites from the Quilt Con show. I immediately took a fancy to What's the Frequency, Love? by Sheri Cifaldi-Morrill. The concept of representing a frequency was pure ingenious, but it's the technical skill employed in making this small quilt is impeccable too. Each pieced line must have been 1/4" or less, and all of the matchstick quilting matched the fabric colors. The workmanship is insane! Here are the small quilt winners of 1st to 3rd place, hung from left to right respectively. 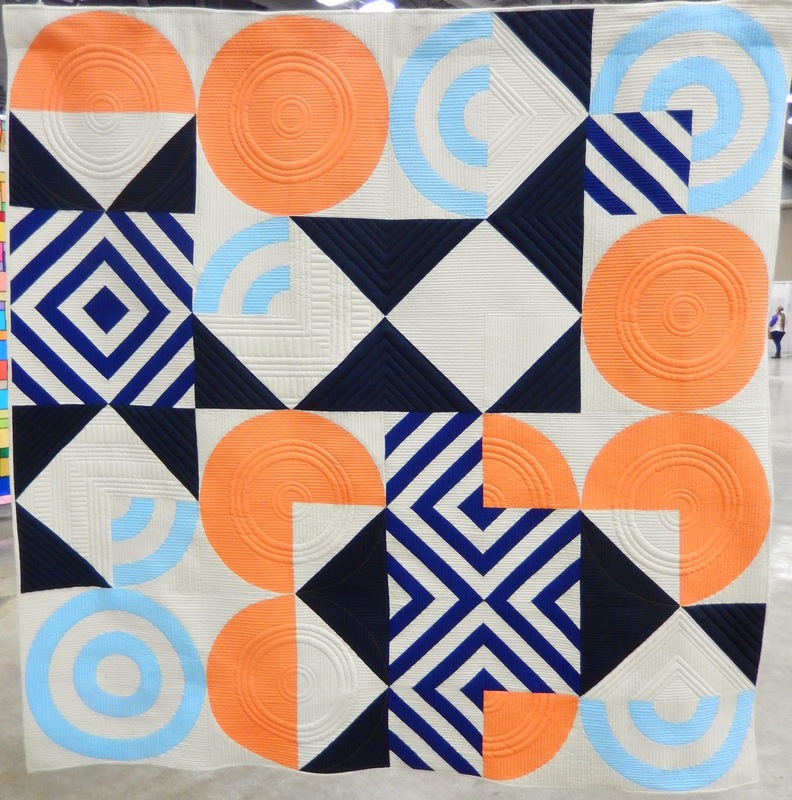 CPU by Katherine Jones was my favorite in the Bias Tape Challenge. It appeals to both my computer-geeky side and my neon-loving, child of the 80's side. How about a closer look at the machine appliqué and big stitch quilting? I can't help but appreciate the great graphic design, limited color palette, and complimentary quilting on the MQG raffle quilt. I love Kathy York's i Quilt, which was awarded Best of Show. Enjoyable look at those Modern quit,s...thank you! That frequency quilt is amazing. I loved it just from your photo, but when I read your info about the sizes, well .... what can I say?